BRICS is the acronym for an association of five major emerging national economies: Brazil, Russia, India, China and South Africa. 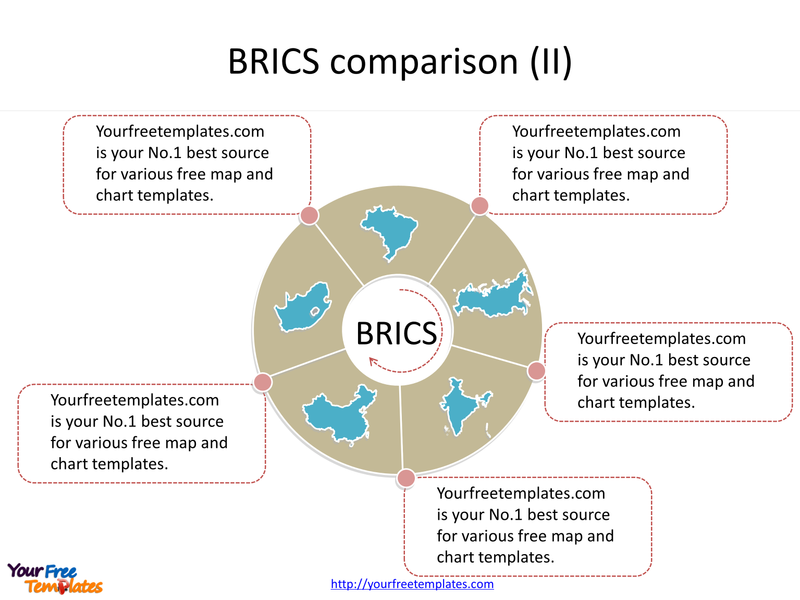 The Create map for BRICS Template in PowerPoint format includes seven slides, that is, use the BRICS country map icons to enhance the attractiveness of slides and deepen the understanding of words. 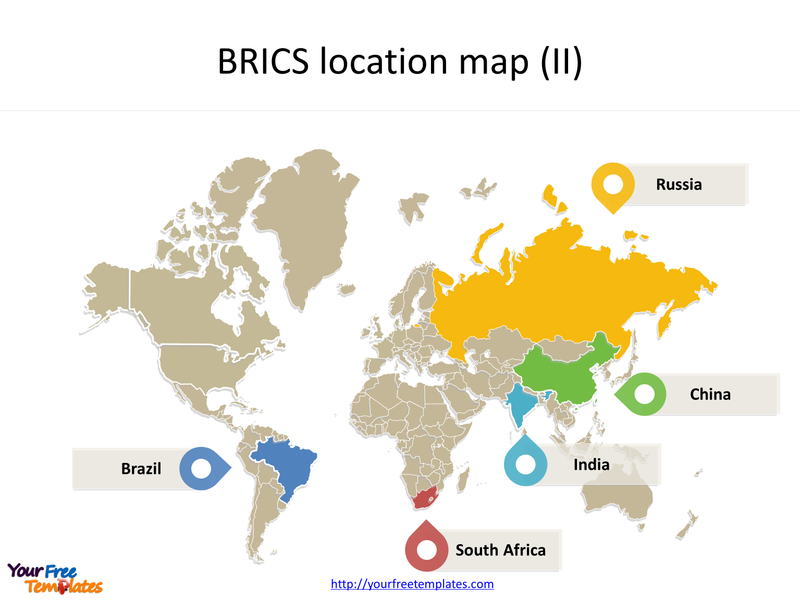 Firstly, in order to show the location maps of BRICS in the world, we can create maps with country outline as icons. Secondly, map icons combining with charts are another effective ways to deliver data associated with country maps. Last but not least, labeling with serial numbers can show the specific location in the world map, making the whole picture easy to be understood. For more information on BRICS, please refer to Wikipedia. 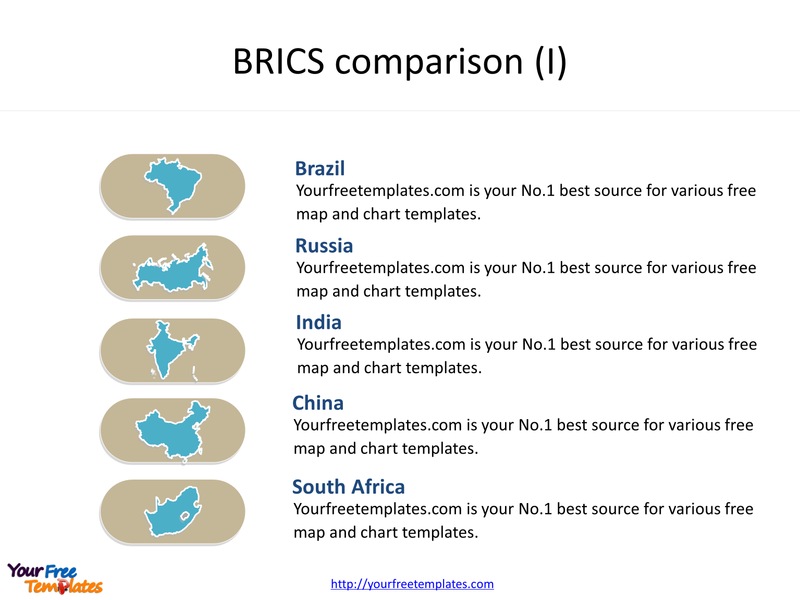 Slide 1, Create maps for BRICS locations with country outline maps. Since every individual political region map is an editable shape. As a result, you can change the texts, colors, sizes, highlight some map shapes, and add your icons or diagrams. 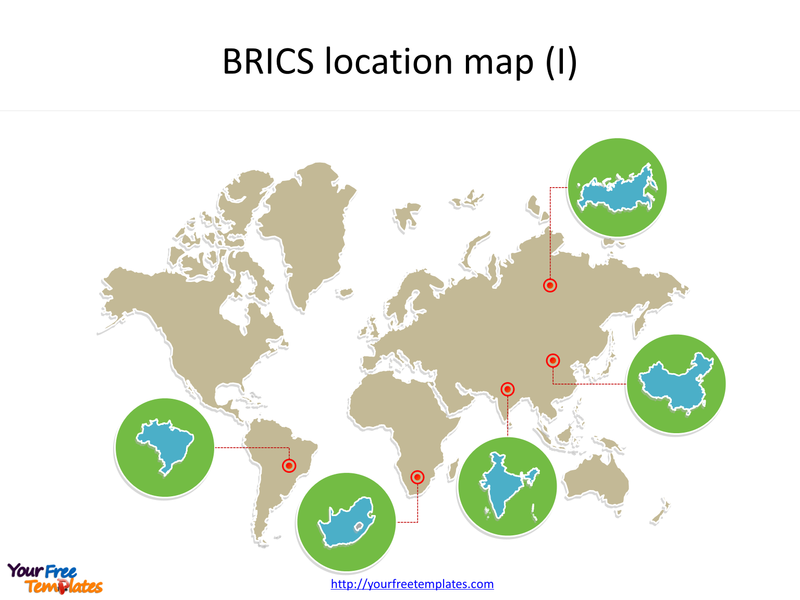 Slide 2, Create maps for BRICS locations by labeled with amazing shapes. Yes you can also try different shapes and adjust the directions of shapes to fit your needs. 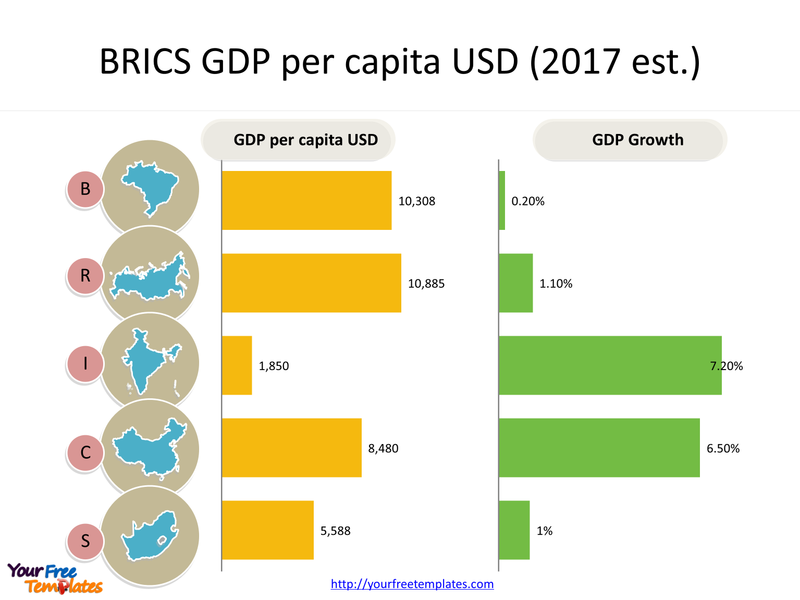 Slide 3, Compare data among BRICS combined with bar charts. Data says everything. From the bar charts, we can see that although the GDP per capita USD for India is quite low now, but it has enjoyed high growth rate. Slide 4, Text description among BRICS with uniform shapes. Again we use map icons to represent the countries. Slide 5, Create maps with Doughnut chart enhancing the effect. The Doughnut chart type is similar to the Pie chart type, except that it has a hole in the center. Doughnut chart can be substitute based on the numbers of countries. You can choose other diagram with map icons to give the slide a different look. 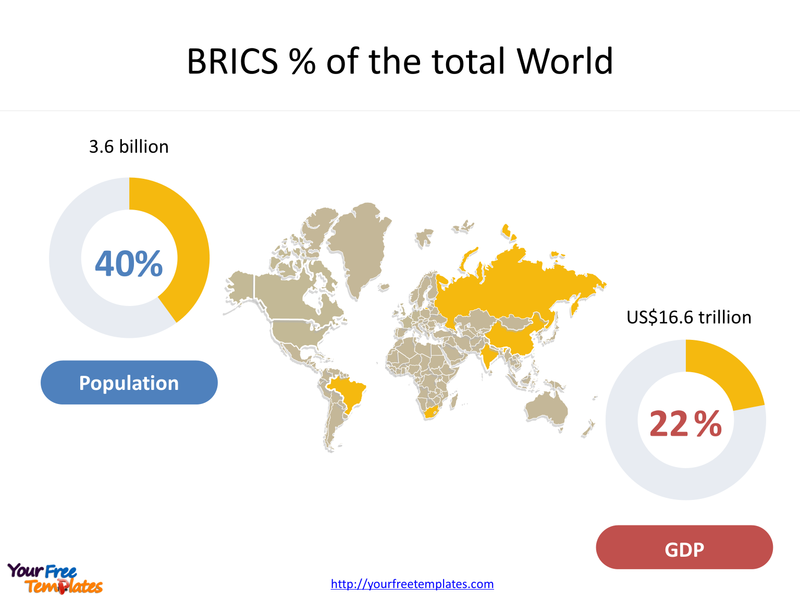 Slide 6, Create maps with Pie charts highlighting BRICS shares. A pie chart (or a circle chart) is a circular statistical graphic which is divided into slices to illustrate numerical proportion. Only BRICS countries are marked and others are filled with grey color. This is another way to associate map with data. As of 2015, the five BRICS countries represent over 3.6 billion people, or about 41% of the world population; all five members are in the top 25 of the world by population, and four are in the top 10. The five nations have a combined nominal GDP of US$16.6 trillion, equivalent to approximately 22% of the gross world product. Slide 7, Label different places in the world map one by one. Create maps with lots of locations and labels are difficulty, but you can use the guidelines to clearly label the places. The grouping has held annual summits since 2009, with member countries taking turns to host. 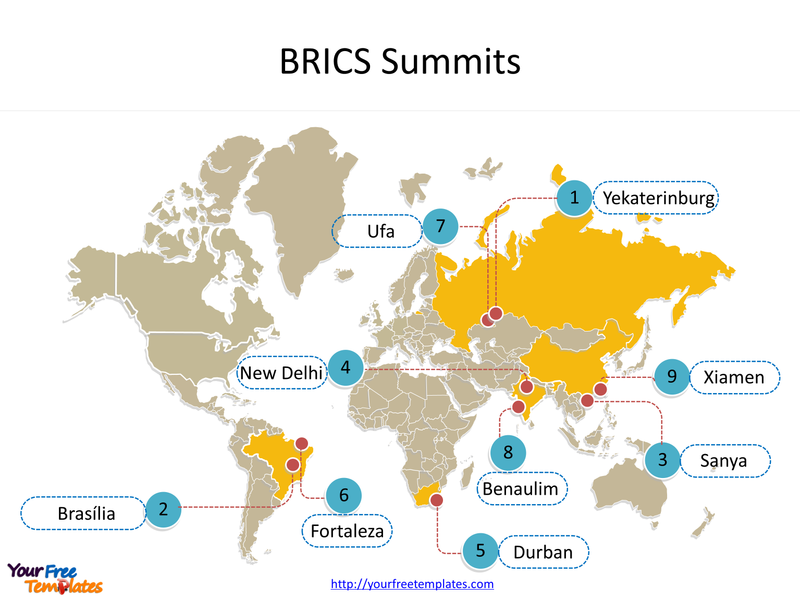 Prior to South Africa’s admission, two BRIC summits were held, in 2009 and 2010. The first five-member BRICS summit was held in 2011. The most recent BRICS summit took place in Xiamen, China, from 3 to 5 September 2017.